Keurig K475 vs K575 which brewer is best ? In the market for a new brewer well you could do a whole lot worse than the mid-range K475 or K575 from Keurig. Not quite sure what the differences are between the Keurig K475 and K575? The K475 from Keurig has a seventy ounce reservoir and and can brew ten different sizes from 4 ounces up to 30 ounces. The Keurig K475 is compatible with the K-cup, K-mug, and K-carafe pods. It has a 2.4 inch touch screen display which can be used to set the brewing strength, temperature control, high altitude setting, energy saver mode, clock, favorites and Carafe auto brew. The K475 does not have a water on demand feature, however it will dispense it without a pod. Brewing time of the K475 is roughly one minute using the pod system and around three minutes if you are brewing for the larger carafe sizes. The K575 is pretty similar in design to the K475. In fact there are not that many differences between the two models. On the K575 you get an eighty ounce reservoir and the ability to brew an extra size than that of the K475. The major functional difference is that there is a water on demand feature on the K575 that can be used any time. Just what what are the differences ​between Keurig K475 and K575? 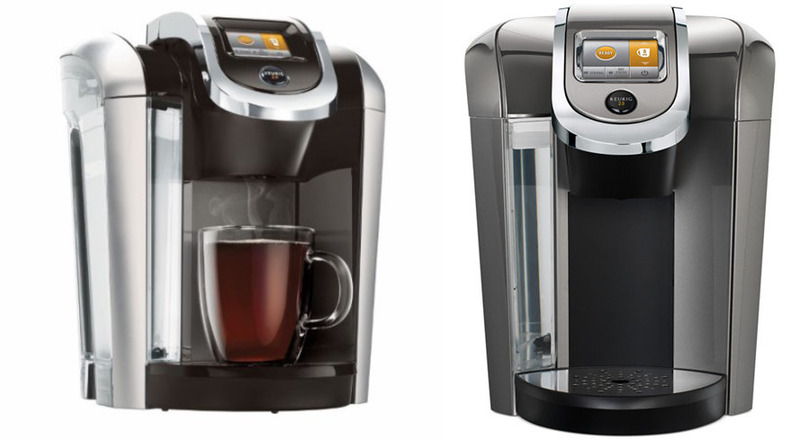 The differences between the Keurig K475 and K575 are at best minimal. Cosmetically they are fairly similar in design. The K575 has a slightly bigger water reservoir and can brew eleven different brew sizes which is one more brew size than the ​K475. Both models from Keurig are​ capable of brewing about ten cups of coffee with the slightly larger 575 having a bit more capacity. The K575 also has a slightly larger touch screen display and it has the ability to produce ​hot water on demand. Keurig K475 vs K575 which one should you choose?